Photo and Article in the Damascus (MD) Gazette, August 7, 2002 about HMAP's Road Show. The sculpture, titled "Harry Hyattstown," in steel and carved wood, 7 x 3 x 2 feet, is pictured with its creator, Tom Barse, 2002. 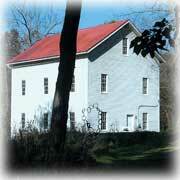 The RoadShow has become an annual tradition for HMAP and the town of Hyattstown. 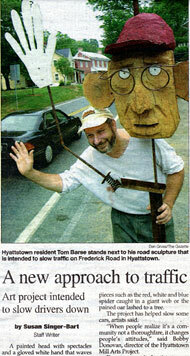 In 2002, HMAP, in cooperation with town residents, installed 20 or so sculptures along Frederick Road (Maryland Rt. 355) which runs through the center of town in a lighthearted effort to slow down traffic. The unusual exhibition attracted the attention of the local news media, in part because of its novel approach to traffic control and the whimiscal nature of one of the prominent works in the show. The story, after being picked up by the news wires, quickly spread nationally and into Canada prompting inquiries from television stations and dailiy, weekly and monthly publications for months. The most photogenic work, a comical carved head dubbed a "road sculpture" by the Damascus Gazette, was seen in hundreds of newspapers around the U.S. The occasion marked the beginning of a tradition HMAP has sought to continue but with a shift in focus away from outdoor sculpture as an imaginative way to affect traffic and instead a way to focus on outdoor sculpture as serious works of art. Totem, in oak and carbon steel, 7 x 3 x 3 feet, by Adam Curtis, 1989, was in HMAP's 2005 Road Show Exhibition.